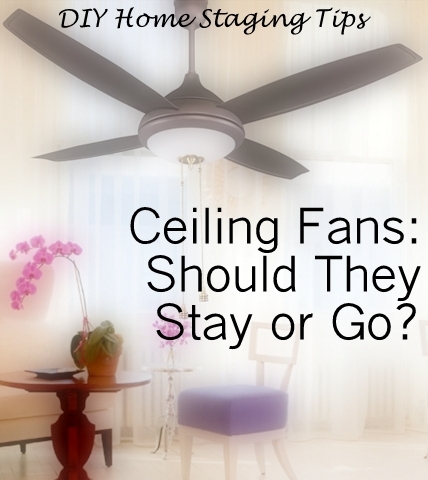 DIY Home Staging Tips: Ceiling Fans-- Good or Bad for Bedroom Staging? Ceiling fans? What would Doug Wilson say? Do ceiling fans stir up interest in your home, or are they just dated ugliness on a stick, with whirling blades? And where do we go for an answer to that question? Years ago, my daughter's home was featured on Trading Spaces, the HGTV show. The designer Doug Wilson made over her master bedroom. One of the first things Doug said HAD to go was the ceiling fan. Well, not so fast, Doug! I've lived in houses with ceiling fans and without ceiling fans. I like that they move the air in a room. I like that they cool in summer, and circulate warm, rising air in winter. I like that they create the sensation of life in a room, almost the way a fire in the fireplace does. And I like that they can reduce heating and cooling bills. If we ask Feng Shui consultant Ann Bingley Gallops, she'll say that ceiling fans properly placed in the bedroom will move energy around, and that's always beneficial. I happen to believe that good Feng Shui is good home staging. But designers like Doug seem to hate the things. If the fan features cutting-edge technology, costs a month's salary, and looks like it was designed by an Italian architect, that's a different story. Then, maybe even Doug will install it. So, what's a homeowner to do when it's time to sell? Do you keep the fan or replace it? What do buyers want? And if the fan comes down, what do you replace it with? The answers have to do with things like the style of your home, the likely buyers, the size of your room, your locale, your choice of fan, and even your ability to keep it clean. If you are presently living in your home, and you actually use your fans and find them quiet and efficient, I would say, leave them there. Chances are good that your buyer will appreciate them as well. If the look and feel of your home doesn't support the use of ceiling fans, if the builder installed them because he thought they looked trendy, if they are oversized or undersized for the rooms, perhaps it's time to replace them with stylish, new lighting fixtures that will look better and be more practical. If the heating and cooling systems in your home are doing their job well, ceiling fans may be redundant and pointless. However, when your home is a city loft with high ceilings, an industrial vibe, stainless appliances, and minimal furnishings, then a sleek, new brushed aluminum ceiling fan may put the finishing touch on your style statement. Or if your home is a classic Craftsman style, you'll woo more buyers if your decor is more authentic, including what's overhead. Period details are important to people who value historic homes. This Mission style overhead fan from Emerson costs $368 from Hanson Wholesale. Ceiling fans with a tropical look are popular, especially in homes located in warmer climates or decorated in that style. These fans convey a certain global flair, hinting at exotic destinations and romantic retreats. Is this the look your home has, and that your buyers will respond to? From Tommy Bahama, this design comes with a $650 price tag. You can spend as little as $40 for a fan or as much as a couple of thousand. Before you spend anything, check customer reviews online to learn about how difficult it will be to assemble or install, how quiet the motor is, and what the long term customer satisfaction is. A ceiling fan is a natural in a summer cottage. Photo: Meredith Corp. I was recently in a home on the market, and when I walked into the bedroom with the owner, I stopped short at the sight of her ceiling fan. The owner admitted that the fan was so low over the bed it was scary. I doubt the sellers turned it on at all. I suggested that she replace the fan with a light fixture suitable for the bedroom. Do you have fans that ought to be replaced by lights? Low-priced, small fans, the ones that sell for about $40, can handle one 60-watt bulb. That's not enough to illuminate most rooms. When your Realtor walks to your bedroom door, and throws the wall switch to show the room to potential buyers, is it bright in there? A Realtor doesn't always have time to arrive ahead of clients and turn on lights. She's not going to walk across the room and turn on bedside lamps. She's busy pointing out other features. It's also a good idea to replace, repair or remove fans that are missing parts, that wobble, are noisy, look out-of-date, or don't fit the room's decor. Typical ceiling fan styles are contemporary, retro, tropical, old world, Asian, Victorian, Mission, and novelty. Maybe your son loved it, but it's time to pack it up for the move to your next home. If you have a fan that needs to look new again, paint it. I suggest you first remove the blades. Just two screws hold each one. Ask me how I know not to attempt painting attached fan blades while standing on a bed. I wish I had a video of my attempt! Do you need some more helpful pointers and encouragement when it comes to sprucing up your home for the real estate market? Order my $4.99 ebook, DIY Home Staging Tips to Sell Your Home Fast and For Top Dollar. It comes with a money-back guarantee. Why go it alone, when you can learn from my experience? How you stage does make a difference, a difference in how much money your home is worth to a buyer.